Hearts were in mouths this afternoon in Ezeiza when Lionel Messi hit the ground in training after a collision with Javier Mascherano which saw Argentina’s medical staff running over to help him. He is, apparently, absolutely fine though. And whilst the selección begin training in earnest, Argentinos Juniors are in need of a new manager – Pedro Troglio is the latest name to be linked with the vacancy at the newly crowned champions. And Seba Verón’s announced he’ll be supporting Gimnasia La Plata on Sunday! Well sort of. Messi’s blow to the head was easily the most talked-about aspect of Friday’s training sessions for Argentina, coming in a challenge with Liverpool midfielder Mascherano which saw Messi wander off and (apparently) lie down head in hands away from the group afterwards. There’s a TyC Sports video purporting to show the incident on the Olé website, but frankly you can see bugger all apart from the advertising hoardings, so I’ve not bothered linking to it. In other national team-related news, Javier Pastore has arrived in Buenos Aires to join the squad, taking the number of the 23 now in the country to 20 (Martín Demichelis, Walter Samuel and Diego Milito are engaged in a kickabout in Madrid on Saturday evening, or something, along with also-ran, not-good-enoughs Javier Zanetti and Esteban Cambiasso). On the domestic scene, Pedro Troglio, the current manager of Paraguay’s Cerro Porteño, has told the press he’s been approached by Argentinos Juniors about the possibility of becoming their new manager following Claudio Borghi’s move to Boca Juniors. He’s made no secret that he’s thinking about returning to his homeland after the current Paraguayan championship is over, and this will fuel speculation that he’s set to take over at La Paternal. Troglio’s CV isn’t bad – the former River, Lazio and Argentina midfielder has been in charge of Godoy Cruz, Gimnasia La Plata (with whom he finished second in the 2005 Apertura) and Independiente before winning last year’s Paraguayan Apertura with Cerro Porte﻿﻿﻿﻿ño. Verón, meanwhile, told the press when asked about the delightful prospect of seeing Estudiantes’ city rivals relegated at the weekend that, ‘I want Gimnasia to stay up,’ he said, explaining that the loss of the clásico platense from the fixture list next season would be a shame. He also confirmed it ‘would interest me,’ if he had the chance one day to become president of the AFA – something current incumbent Julio Grondona said on Thursday he’d like to see. 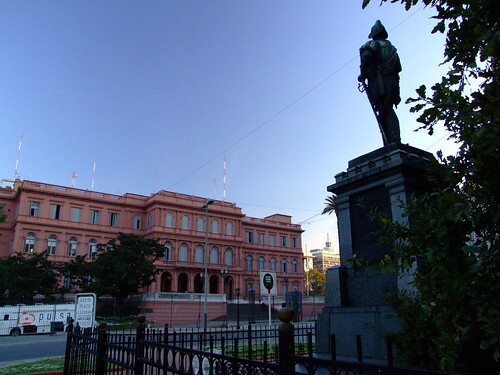 Given that La Brujita already seems destined to one day become president of Estudiantes, why not go the whole hog – Verón for the Casa Rosada? Photo taken from my Flickr page. I know this doesn’t pertain to your post, but I was wondering who, if Maradona goes after the World Cup, you would like to see take over as Head Coach of Argentina? My choice would be Alejandro Sabella. Though he has little more than a year’s experience as a Head Coach, the job he has done at Estudiantes is excellent. After Diego’s volatile reign, it would be nice to have someone in charge who will focus on the job, and not get caught-up in myriad dramas. Hi Toby, welcome to HEGS. Personally I think anyone would be an improvement on Maradona. Who on earth Grondona will choose though, I don’t want to even hazard a guess – when Basile quit I wrote an article for Soccernet outlining the contenders to take over which didn’t even mention Maradona as one of them, I thought it was such a ridiculous idea! I’m always torn about Pekerman – on the one hand, his team played fantastic football. On the other, sometimes coaches with vast knowledge from working with youth teams struggle to bring in new players and make necessary changes (see Domenech). Still, as long as the ‘Don doesn’t get an extension, I expect an improvement.